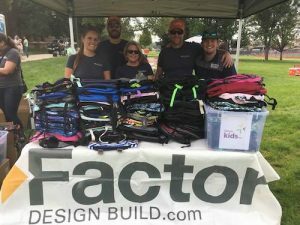 Giving back to the Denver community is a big part of what we do here at Factor Design Build. We just love making life better for people. One of our charitable contributions recipients is Denver Kids, Inc., an amazing organization that helps kids in the Denver Public Schools who are facing personal challenges. This year we helped out with their annual Backpack to School BBQ. Getting through your school age years can be tough, and often, life dishes out a harder road to some children. Luckily for our community, Denver Kids is there to help! They support students Kindergarten through High School who are facing different challenges and living in higher risk environments. 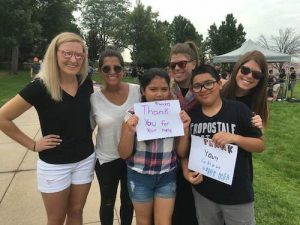 Denver Kids reaches out to help students finish high school, get career training or get into college, and get other services that help them become contributing members to our society. Imagine being a kid and knowing your family can’t afford to buy you your back to school supplies. That’s where the Denver Kids Backpack To School Kickoff came in! 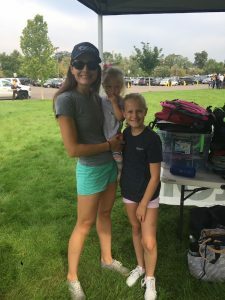 The Denver Kids Backpack to School Party is an event where back to school supplies are provided for kids who really need them. 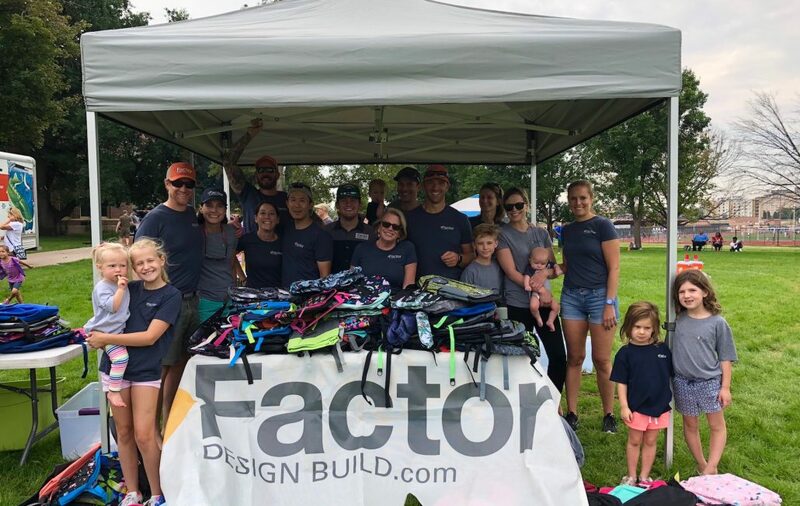 Factor Design Build was thrilled to be a part of this essential community event. Our Community Service Team was ready to help! Our Factor teams met up on the morning of Saturday, August 18th at South High School to help set up the school supplies and prep the place for the fun and food to come. Friends and family of our teams were on hand too, and helped out with all the activities. Our team manned the backpack table and helped students choose their awesome backpacks and the supplies to go in them. Other tables let kids choose everything they need for back to school including paper, pens, notebooks, coloring items, pencils, glue, scissors, tissue, and lots more. The kids had tons of fun with our volunteers! The day was about a lot more than school supplies. 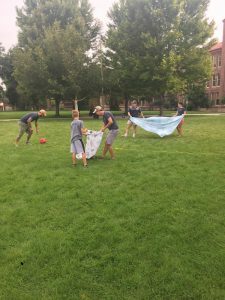 Kids had a blast playing games, and our volunteers helped out with hula hoops, and a crazy game called Sheet Ball that involved tossing a ball back and forth with bed sheets! There was plenty of food on hand as well. The Factor Design Build Team served up tasty hamburgers and hot dogs, plus healthy fruits and snacks to kids and their families. 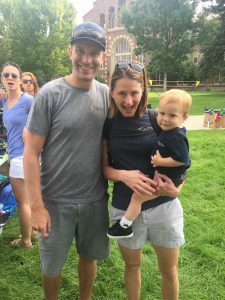 Want to get involved with Denver Kids? If you’re feeling inspired to help out, there are lots of ways you can get involved with Denver Kids. Become a Mentor. Mentors are caring, supportive adults that kids can turn to for guidance. As a Mentor, you become a role model and a great source of consistency in a child’s life. Become an Investor. Investing in Denver Kids is a great way to support the organization. Become a Volunteer. Denver Kids depends on volunteers for their survival. You can choose to provide administrative support, event and activity support, or transportation. You can stay up to date on the latest volunteer opportunities and events by liking their Facebook page or subscribing to the Denver Kids, Inc. newsletter. When you work with us, you give back too. When you do business with us, Factor Design Build donates 1% to a charity of your choice. This is in addition to working with a company where giving back to the community is one of our core corporate values. Want to get involved in some of our incredible projects? Contact us today to find out more details about Backpack to School and other awesome Denver community events.